Trying to establish better perimeter security can involve a few different measures put into place. Trying to secure your commercial property can be as extensive or as minimal as you see fit. Whatever you do, you’re likely going to end up utilizing a couple of elements to make the right security approach for you. The ultimate goal is to create clear, obvious boundaries that separate your property from the public while also having some actual security built-in in case anyone disregards those boundaries. 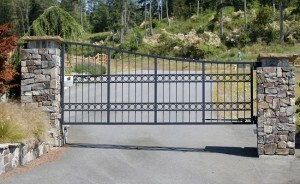 Let’s take a look at some of the basics of perimeter security. Locks are such a fundamental part of security and they come in so many different forms these days that it can be confusing as for what you should choose. There are smart locks, padlocks, bolt locks, and more. When and where you’ll need locks is going to end up being pretty obvious to you but regardless, just make sure any locks you end up using are built to a high-quality standard to prevent vandals or break-ins. Outdoor lighting is a fantastic deterrent to keep burglars or vandals away from your property. This is an element people often forget about, but lighting can really help in defining where your property begins and ends. The best kinds of lighting are motion-activated floodlights, which will illuminate a huge area and prevent anyone from venturing further onto your property. Just make sure whatever lighting you do install is properly placed. Physical barriers are just as important as anything else. Security fencing or louvers can be a great way to offer yourself some privacy while also making your property more secure. If security is really a concern for you, keep in mind there are additional options like gates, barbed wires, and even electrification. Combining your fence with other features like gates, louvers, or lighting can be the perfect way to protect any commercial facility. This entry was posted on Friday, August 17th, 2018	at 4:17 pm	. You can follow any responses to this entry through the RSS 2.0 feed. Both comments and pings are currently closed.